This chapter tells the story of office-to-residential change of use in Croydon. A similar approach is taken to Camden in terms of what the chapter covers; however, some of the impacts in this place are different. 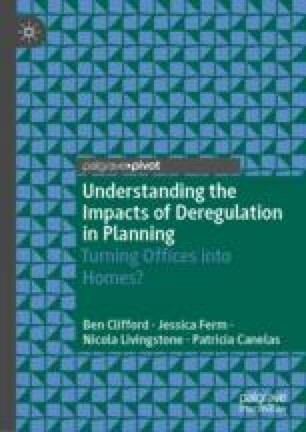 The chapter highlights the issues seen in Croydon, particularly the issues of residential quality and the overall impact on local services from the large number of units delivered. These issues surrounding the development of what might have been called (by some research interviewees) ‘slums of the future’ will be highlighted throughout the chapter through its focus on the particular ways that central government-driven deregulation has had impacts in Croydon and threaten the otherwise positive effort to regenerate the town which the local authority and partners have been driving. Architects Journal. (2005). Croydon Approves Major Refurbishment and Redevelopment Scheme. https://www.architectsjournal.co.uk/news/croydon-approves-major-refurbishment-and-redevelopment-scheme/584327.article. Accessed 20 October 17. BNP Paribas. (2016). South East Offices. https://m.realestate.bnpparibas.co.uk/upload/docs/application/pdf/2016-04/south_east_offices_apr_16.pdf. Accessed 20 October 17. Bravo Investment House. (2017). The Quaters, Croydon. http://www.bravo-investment.com/project/the-quarters-croydon/. Accessed 01 March 18. Brophy, G. (2008). Croydon Finally Gets a Facelift. http://www.telegraph.co.uk/finance/property/3360489/Croydon-finally-gets-a-facelift.html. Accessed 20 October 17. Colliers International. (2016). South East Offices. http://www.colliers.com/-/media/files/emea/uk/research/offices/201607_seofficessnapshot.pdf?la=en-gb. Accessed 20 October 17. Croydon Council. (2014c). Planning Committee Report. https://www.croydon.gov.uk/sites/default/files/articles/planning-committee-report.pdf. Accessed 20 October 17. Croydon Council. (2017a). The Croydon Monitoring Report. https://www.croydon.gov.uk/sites/default/files/articles/downloads/Monitoring%20Report%20summary.pdf. Accessed 20 October 17. Daily Mail. (2016). Properties with Social Appeal. https://www.dailymail.co.uk/property/article-3465883/Firsttime-buyers-lured-communal-gyms-roof-gardens-swimming-pools.html. Accessed 01 December 18. Evening Standard. (2016). New Homes: Green Dragon House. https://www.homesandproperty.co.uk/property-news/buying/new-homes/new-homes-in-croydon-green-dragon-house-a98206.html. Accessed 20 October 17. Foxtons. (2017). Fifteen Lansdowne. https://www.foxtons.co.uk/newhomes/fifteen-lansdowne/. Accessed 01 November 17. Kingsley Hamilton. (2017). Green Dragon House. https://www.kh-estates.com/property/green-dragon-house/. Accessed 20 October 17. NOMIS. (2017). Official Labour Market Statistics. https://www.nomisweb.co.uk/census/2011/ks101ew. Accessed 1 November 17. Savills. (2015). Croydon Office Rents to Rise by 63% in Two Years Says Savills. http://www.savills.co.uk/_news/article/72418/197311-0/12/2015/croydon-office-rents-to-rise-by-63–in-two-years-says-savills. Accessed 20 October 17. Silver & Co Architects. (2017). Green Dragon House, Croydon. http://www.silv.co.uk/case-studies/green-dragon-house-croydon/. Accessed 20 October 17. TLE. (2015). Cleaning-Up Croydon. https://www.thelondoneconomic.com/property/cleaning-up-croydon/23/06/. Accessed 20 October 17. UK Business Property. (2013). 14 Storey Croydon Office Block Sold for Resi Conversion. http://ukbusinessproperty.co.uk/news/locations/14-storey-croydon-office-block-sold-for-resi-conversion. Accessed 20 October 17.